Pearl Django is a jazz group established in 1994 in Tacoma, Washington by Neil Andersson, Dudley Hill, and David "Pope" Firman. 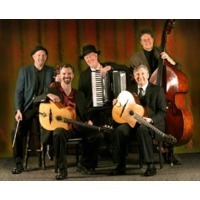 The group's stated focus is to incorporate the music of Django Reinhardt and Stephane Grappelli with American swing music. Initially a trio, they have changed and added members over the years and are now a quintet. Based in Seattle, they have played around the United States, as well as in France and Iceland.